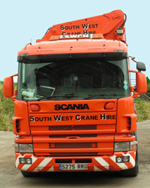 South West Crane Hire (Plymouth) are the leading mobile crane and HIAB operators in the West Country. 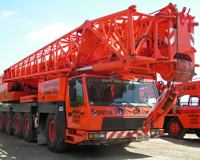 South West Crane Hire has 6 well equipped bases. Our Crane Hire Plymouth Depot is fully manned and operational and offers lifting and transportation services both locally and throughout the South West. Along with Crane Hire depots in Bristol, Exeter, Barnstaple, Yeovil and Taunton. South West Crane Hire Plymouth is able to provide the full range of services to lift and transport items large, small and just plain awkward! Each location is fully staffed with trained, experienced personel that have been involved in a wide variety of lifting and moving operations. No job is too big, too small or too difficult. The health and safety of our customers and staff and the safe movement of your goods is central to our way of working. Our comprehensive service includes full site surveys to ensure there are no surprizes, for you, us or your goods. We are a family business, established in 1972, and can offer you the size and quality of equipment together with the trained personnel necessary to ensure your goods are lifted and moved safely. Call us now on 0800 2943381 or locally on 01752 562333. Or Contact us and we'll get straight back to you. Accidental damage to the crane on hire to the full replacement value. Continuing hire charges whilst the crane is out of service. Care in respect of the goods being lifted. Public liability insurance to all parties including third party property. Injury to our own staff. Please note, that subject to a higher rate some of these factors can be waived - ie hired in plant cover. Please contact us for further details. 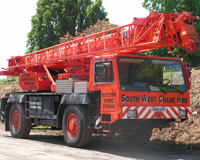 For more information on South West Crane Hire Plymouth, call us now on 0800 2943381 or locally on 01752 562333. Or Contact us and we'll get straight back to you.